In between rehearsals for the East Coast premiere of her opera, Cold Mountain, Pulitzer-winning composer Jennifer Higdon is preparing for another big event. At Curtis' Field Concert Hall, on Sunday, January 24th at 3:00 pm, Dolce Suono Ensemble will premiere a new work of Higdon's for flute, cello, and piano. American Canvas is a musical expression of three American painters: Georgia O'Keeffe, Jackson Pollock, and Andrew Wyeth. 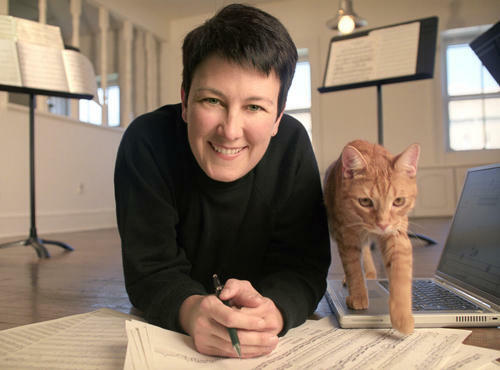 As part of the concert, "Women Pioneers of American Music," Dolce Suono commissioned Jennifer Higdon to compose this work. The composer stopped by the WRTI studios to chat about American Canvas with WRTI's Susan Lewis. 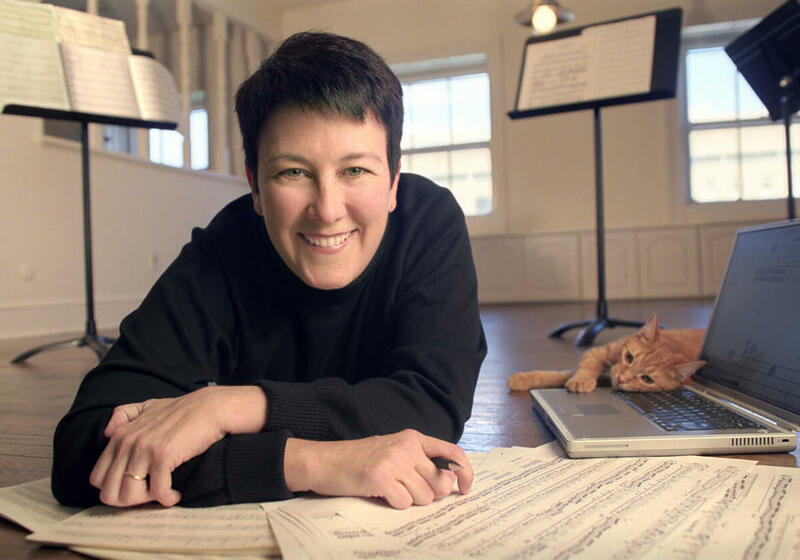 Listen to Jennifer Higdon talk with WRTI's Susan Lewis about how the styles of O'Keeffe, Pollock, and Wyeth informed her new work, 'American Canvas,' for flute, cello, and piano. 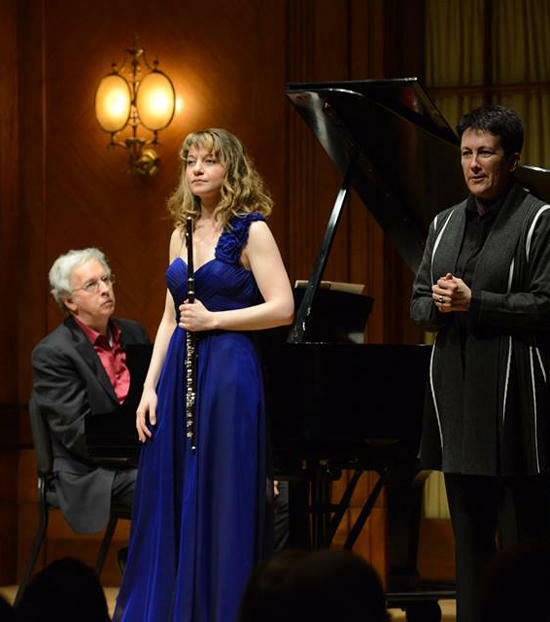 Composer Jennifer Higdon (at right) pictured with Dolce Suono Ensemble's Mimi Stillman, flutist, and Charles Abramovic, pianist. Jennifer Higdon: Yeah, this is actually a premiere. They commissioned the work. You know, it’s kind of nice, it’s a little bit like coming home, having been a flute player. So it’s very familiar, so I didn’t have to investigate the instruments like I normally would if I’m writing something. So, it was kind of cool to think of creating a chamber work for flute. We have pieces for flute, cello, and piano but there aren’t a ton of them, usually it’s just flute and piano, or flute. So, it was nice to have kind of the interaction of the instruments. And what was the idea ? So I made the decision early on, Georgia O'Keeffe; have always been fascinated with her paintings. And also her career, but her paintings really stand out for me. Jackson Pollock. I thought, Pollock has an incredibly different style than what O’Keeffe has done. And then I thought, of course, living in this area, Andrew Wyeth. I adore Andrew Wyeth’s works. I love the paintings. To me, if you walk into a room and there’s an Andrew Wyeth on the wall, it stands out. So those are the focuses of each of the movements. Wow! Interesting, because they’re all very different. Right. Which kind of lends itself to making a varied musical texture. I thought about the way they work. 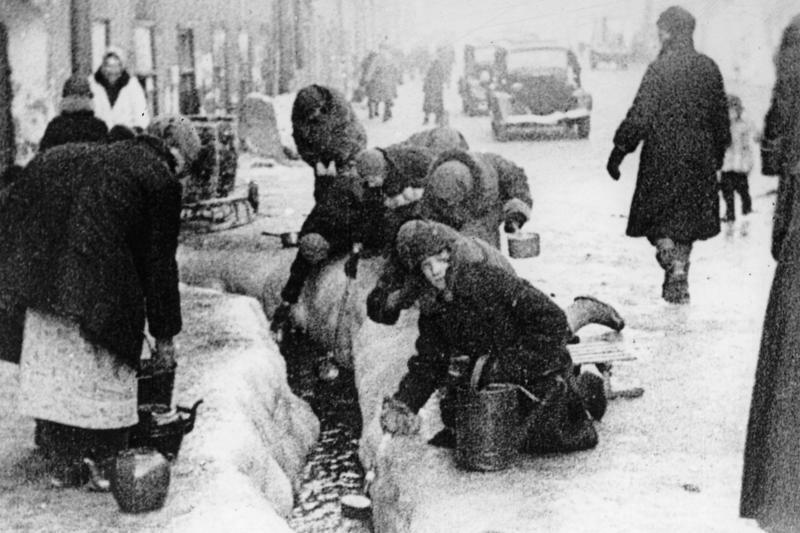 They all had different methods of working. I mean, splatting paint is very different than, as Pollock would do, would be very different than Wyeth, who is so meticulous with the egg tempura, which has to be painted with very quickly, because it dries. So, the light that emanates from the canvas is different. And, this summer I was out in Santa Fe, so I got a chance to really experience O’Keeffe, touring the O’Keeffe museum, also her house, one of her houses is in Abiquiu, where she worked. They still have the canvases there. They still have the studio she worked in. And being around the landscape where she painted so much out there, it made a real impression on me. And I’ve read the biographies of all of these painters, so I feel fairly versed, and the way they thought about what they put on the canvas, and also the way they would sometimes come back to certain subjects. Pollock is mostly known for those splatter paintings. And of the three artists, he had the fewest canvases, because he had the shortest life. Andrew Wyeth is actually the person who lived the longest. And, I find everything he’s ever painted just incredible to look at. And they’ve recently opened his studio down at the Brandywine. So, probably about a year ago, I went down there and took a tour of it; just a regular tour, and I loved seeing where he worked. Looking at the floor, the boards, they have all of the paints around, you know, empty egg cartons. It’s just completely fascinating. You know, I think there was a movie - Ed Harris did it at some point - that was on his life, and I read the biography on him as well. But because they were all different, and their canvases were all so striking and they made quite a mark on American visual artistry, I thought those three would be perfect together. Is your music expressing any particular painting of each of the three, or their styles? Yeah, a little of both of those – I mean, it’s their styles. O’Keeffe has very bold gestures that are very distinctive – they’re clean in lines. So, from the Pollock, there’s a lot of chaos; actually, just chaos swirling all around. In the case of the Wyeth, that one movement took me longer to write. Maybe because I was thinking about the fact that he’s so meticulous, that it took him so long to do those paintings. The detail in his paintings is probably greater than I think I’ve seen in any other painting, if you really look at it, and you read about his process. So as a consequence, there are a lot more layers in that movement, and there’s just more intricate detail in the dynamics, the gestures, the way they repeat, because I’d imagined him making strokes, one stroke after another, tiny strokes. I mean, you look at his canvases, you can see every leaf, every blade of grass. You look at Christina’s World, it’s stunning. I’m like, “How did he paint every blade of grass?” But he actually, he did. So I tried to create a movement that reflected that. This work has a lot of personal resonance to you, because it’s the flute for one, and because you grew up in a house surrounded by visual arts. Yeah, and I think I saw all of these artists when I was younger. I think at some point my dad took me to a museum that had each of these people - had some sort of canvas from them. I have to think that that had to have affected my composing, because I tend to think when I’m deciding what color to use in an orchestra, I’m always thinking of canvases. You’re thinking in terms of visuals. Right. So, like, this is kind of a blue sort of sound, or I’ve realized that I’ve had too much of one color, maybe it’s all woodwinds, and I need a different color. So it’s if a painter’s said, “Oh, I need a little yellow right here.” So, I think the same way, I just kind of put those terms in, I guess, the expression of an instrument. Have you’ve done music based on visual arts before? I have a lot of music that’s based on nature. I have, my piano trio actually is like two canvases, the movements, even though it’s called Piano Trio, the first movement is called “Pale Yellow." and the last movement is called “Fiery Red” because I wanted to see if I could make music that had that kind of contrast of the colors between pale and fiery, and yellow and red. But I had always found it fascinating the way visual artists work, because there are actually similarities in the same way a writer would find similarities in a composer. You do have to think about the colors, you do have to think about how you handle the material, the theme of something, I mean, the painting has to be about something specifically. O’Keeffe has a famous skull picture that has the white skull in the middle with the three bands of color running vertically. So that’s an image that’s so - it stands out in my head, I’ve got the print in my place, so it’s something I’ve looked at years, and years, and years. And in fact, you know, at one point, I was making a painting for someone just as a joke; we were talking about Pollock, and I thought, “Maybe I’ll try one of these splatter paintings.” So, somewhere floating around Philly is this splatter painting I did that’s kind of a la Pollock. It’s kind of interesting as a composer to try actually painting like that. Information about Dolce Suono Ensemble's concert, "Women Pioneers of American Music," featuring works by Amy Beach, Marion Bauer, Ruth Crawford Seeger, Andrea Clearfield, and world premiere by Jennifer Higdon. Sunday, January 24th at 3:00 pm, Curtis' Field Concert Hall. In early 1941, Dmitri Shostakovich was nervous. He was one of Soviet Russia's most brilliant composers, but he had fallen out of favor with the ruthless dictator Joseph Stalin. He'd been forced to denounce several of his own pieces of music, and some of his friends and family had been imprisoned or killed. He knew the same thing could happen to him.